The European union has selected the Finnish Meteorological Institute to lead an international space effort whose goal is to build the largest and fastest man-made device. In December 8-9, 2010, the kickoff meeting of the electric sail EU project was held at the Finnish Meteorological Institute. The meeting gathered space scientists and engineers from Finland, Estonia, Sweden, Germany and Italy. The ESAIL project will last for three years, its EU funding contribution is 1.7 million euros and its goal is to build the laboratory prototypes of the key components of the electric sail. In the EU evaluation, the ESAIL project got the highest marks in its category. According to estimates, a full scale electric sail will produce one newton continuous thrust and weigh only 100 kg. 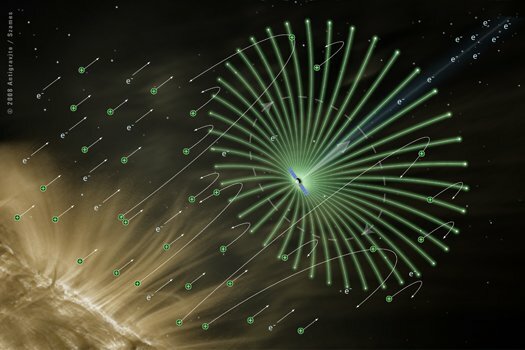 In certain missions the performance level of the electric sail is 100-1000 times larger than that of present chemical rockets and ion engines. The electric sail consists of long and thin metallic tethers which are kept in a high positive potential by an onboard solar-powered electron gun. The charged tethers repel solar wind protons so that the solar wind flow exerts a force on them and pushes the spacecraft in the desired direction. By some estimates, after a year in flight an ESAIL could hit about 19 miles per second. A potential speed of 68,400 MPH would more than double the current record of 24,000 MPH held by NASA's ion-propelled Dawn spacecraft. Whether the ESAIL will be able to do the Kessel Run in less than 12 parsecs remains to be seen.